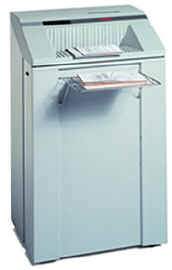 The Intimus 007se is a high security confidential document shredder. Usually for up to 8 users. Shreds to Security Level 5. Mounted on rollers for easy movement. Hardened cutter disks. LED indication for paper jam, door open and bin full.